Over the years I've been collecting examples of some of the less well known root crops from all over the world and trying them out in our own vegetable patch. 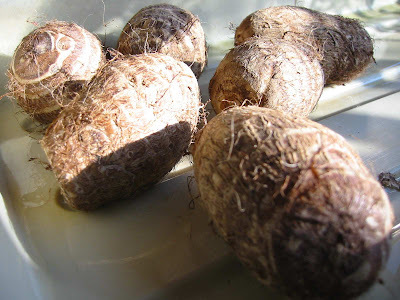 This year I'm growing several types I've tried before and a new vegetable to me, eddoes or taro which is the tuberous root of a tropical plant and probably won't do very well in temperate conditions of Northern France. I found these in the supermarket, origin China, and decided to have a go. I’ve grown ornamental leaved colocasia and alocasia in the past, this is my first attempt at a food crop variety. Like little coconuts in form, hairy and unappealing, they are supposed to be potato or yam like. I’ve planted two in the propagator and will eat the rest for supper so I can’t comment on the taste yet. I'm hoping they will be more successful than a previous attempt to grow sweet potatoes. The plant grew vigorously but was a martyr to red spider and finished the year with no roots at all. I think the vine weevils must have had them. I’ve discovered the French actually think of these as Japanese artichokes. 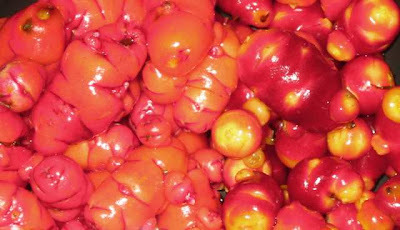 Rarely available in quantity they are a speciality vegetable used as a treat in several asian cuisines, often as pickles and popular in France as a cooked vegetable since they were first introduced in the 1880s. They’re small and knobbly, crisp and starchy and can be eaten raw, steamed or fried. The flavour is pleasant, not very artichokey but enjoyable and the texture is excellent. The most difficult part of cleaning them can be helped by rubbing them in a coarse cloth with a little salt which removes the thin skin. Give them a good rinse and cook immediately, they won’t store like this. In fact, they don’t store at all well so if your ground is light and well drained only harvest what you need. If you do need to take them all up (and they won’t survive waterlogging) then keep them in an almost airtight container in the fridge and check them regularly. Whatever you do they will start to sprout in the spring so pop them back into pots to get started and plant out as soon as the last frost has been and gone. Originally from the Andes Oca has been adopted by New Zealand as an agricultural crop and my starter seed tubers were actually imported from there via Waitrose. I have two varieties, a shocking pink and a darker almost maroon coloured sort and I notice that Realseeds have a cream coloured sort that is claimed to be more productive than the cultivars in my collection. Of the two I grow the shocking pink is hardier and gives a greater yield but due to mismanagement I may have lost the darker sort for the coming year. They are not as cold resistant as the pink ones and I only have a couple of rotting examples left to replant this spring. 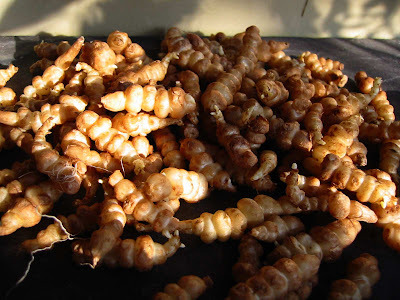 The tubers are crunchy with a slightly acid potato flavour and nice cooked teppanyaki style or roasted. They keep well in cold storage and should be started back into growth in the spring by potting them up until the weather improves and then planting out. The tubers don’t form until the late autumn so some frost protection is helpful in a bad season. They will overwinter in the soil but since they store well it’s better to lift the crop in late November, clean it off and keep it in the fridge to avoid damage if the weather turns harsh. These big bullies of plants are neither artichokes or from Jerusalem but a close relative of the sunflower with a tasty and edible but almost indigestible tuberous root. Once you have in them in your garden they can be impossible to eradicate but make useful famine food, rarely failing to produce a crop even in poor seasons and storing well in the ground over winter. A well documented side effect of eating the tubers is uncontrollable flatulence, so much so that they are avoided in this house almost entirely but to catch a hint of their smokey and interesting flavour without need for further fumigation cook a couple whole in their skins until soft (much easier than peeling), remove skins and then incorporate the soft flesh into your mashed potato. What famous person am I?